If so, you may already know that billing your American clients in U.S. dollars makes it simpler for them to understand and approve your invoices for payment. It increases the probability of getting paid faster, and your U.S. clients will love you for saving them from having to calculate exchange rates. What other benefits are there for Canadian firms billing U.S. customers? Besides getting paid faster and making your customers happy, what’s in it for Canadian firms in general? Some Canadian companies receiving payments in USD keep an eye on the market looking for a strong U.S. dollar to make the currency conversions when it makes the most sense for them. If they have U.S. suppliers, they can save on multiple exchange fees. But there is another way Canadian businesses can improve their bottom line. Now you can send your U.S.-destined invoices directly to a United States postal facility and completely bypass the borders. Don’t believe it? It’s really quite simple. There are no borders when you mail through the internet. DocuSend does just that. The average published mail delivery time from Canada to the U.S. is 4 to 6 days. But all mail originating outside the United States to be delivered inside U.S. territory is subject to examination by the U.S. Customs and Border Protection (CBP) before it even gets to a USPS sorting facility. And as we all know, complications occur at international borders that can delay mail delivery as much as 2 to 3 weeks. DocuSend’s print-to-mail web-based service delivers your invoices to a USPS facility by the next business day, and they are generally in your customers’ hands in 1 to 3 days after that. How much can Canadian businesses save with DocuSend? Canadian postage is $1.20 CAD to mail a one-page invoice to the U.S. (less than 30 g). If you mail multiple-page documents or you want to add an additional insert that increases the weight to 30-50 g, the postage increases to $1.80 CAD. Plus, you still have to pay for the printing, folding, and stuffing, then the postage application, sealing the envelopes, and delivering them to a Canadian postal facility. And don’t forget to add the cost of the labor, the paper, and the envelopes. Even if you mail 1,000 documents or more, those same one-page invoices will take you less than three minutes to upload to DocuSend and will cost you 80 cents USD per envelope mailed—and that’s for envelopes weighing up to 2 ounces (56.7 g). That includes labor, postage, materials, everything. 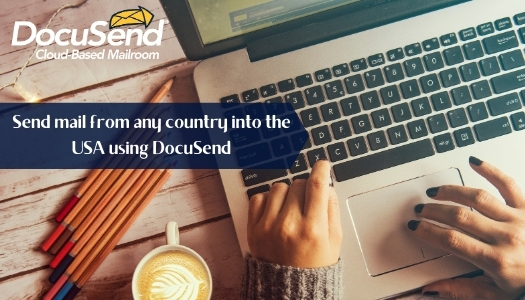 The average cost of mailing a one-page document from Canada using DocuSend is $0.80 vs $2.00 CAD to mail it yourself. DocuSend is a cloud-based mailroom with no monthly minimums, contracts, or service fees. Everything is built into one low package rate, and you’ll realize significant materials savings because our bulk purchasing power gets passed on to you. Your cash flow will improve by reducing operational expenses and expediting receivable revenue. Try it once and find out why we have a 95% retention rate. It’s faster than buying a Canada Post stamp!